Explanation: The galaxies of Abell 2666 lie far beyond the Milky Way, some 340 million light-years distant toward the high flying constellation Pegasus. Framed in this sharp telescopic image, the pretty cluster galaxies are gathered behind scattered, spiky, Milky Way stars. At cluster centre is giant elliptical galaxy NGC 7768, the central dominant galaxy of the cluster. As the cluster forms, such massive galaxies are thought to grow by mergers of galaxies that fall through the centre of the cluster's gravitational well. Typical of dominant cluster galaxies, NGC 7768 likely harbours a supermassive black hole. 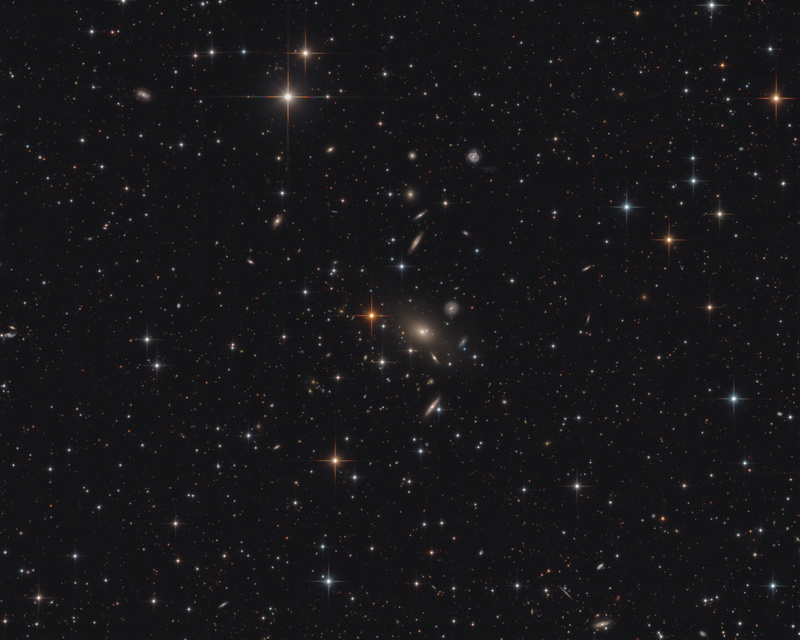 At the estimated distance of Abell 2666, this cosmic frame would span about 5 million light-years.